Rumor was saying that the yet to be launched Vivo X7 smartphone will be coming with Mediatek's Helio X25, vivo has now confirmed that its newest X7 smartphone will be powered by Qualcomm's Snapdragon 652 chipset. This information is from an insider that says MSM8976, which is nothing but SD652 SoC. The company has also confirmed that this smartphone will be coming with a 4GB RAM and 64GB internal memory. Like seriously, the rumors came to pass. 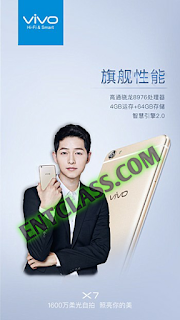 Also, an insider states that Vivo X7 is coming with Wisdom engine v2.0. What is Wisdom engine? Wisdom engine is something which reportedly makes sure that the CPU and memory performance doesn't drop. Rumors and insider has also confirmed a front fingerprint sensor, 16MP front camera for the Vivo X7.